Open since mid-2011, The Atlantic has more recently added a dedicated champagne and oyster Bar. Designed by the Melbourne-based designer Blackmilk, Atlantic (and its underground bar, The Den) mixes classical elements with modern touches and the result is a streamlined interior that exudes a warm and welcoming atmosphere – the perfect environment for a glass of France’s best. The new addition centres around the ‘thrill of the oyster’ (all shucked to order). Matched with the Atlantic’s dedicated wine program you’ll be able to enjoy premium quality seafood and champagne well into the night. Go for: Open till 1am seven nights a week, the Champagne and oyster menu on offer is an absolute treat. If you’re visiting Australia’s western most state, then Must’s champagne lounge is your one-stop-shop. Set upstairs at this award-winning wine bar, the lounge offers a sensational selection of champagne houses to choose from, including Dom Pérignon, Lanson and Bollinger – boasting one of the widest ranges in the country, in fact. Sit back, relax and treat yourself to some fine offerings, all while soaking up the plush interior and nibbling on a delicious selection of menu items that head chef Andre Mahé and chef/partner Russell Blaikie have put together to match their sensational wine list. 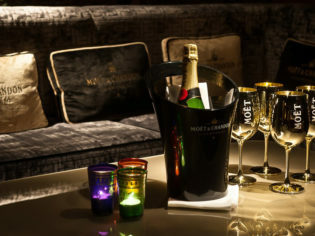 Go for: The range of champagnes on offer and the venue’s dedication to offering a ‘champagne experience’. This aptly-named ‘water of life’ cocktail bar is discretely nestled on Sydney’s Darlinghurst Street. What you’ll find is a dimly-lit, secluded and warming and tippling environment, perfect for a round of champagne cocktails and some intricately-prepared bar snacks. Prepare yourself though – the highly-skilled bartenders at this speakeasy make a habit of opening every bottle of champagne with some Napoleonic ‘flash’ – that is, they sabre off the bottle head using their very own French sword and serve it straight into fine flutes at the bar. Go for: The sabering of the champagne bottle – you’ll find it nowhere else – and the exquisite cocktails on offer. Lavishly-appointed Spice Market is a melting pot of striking interiors – rich colours and decadent trappings, inspired by both Middle and Far-Eastern style; the kind of place that would impress a Pharaoh. And nowhere is the sumptuousness more apparent than in Spice Market’s dedicated champagne lounge, Belle Epoque – so named after Europe’s most celebratory period, in which champagne was consumed like never before. Sit on a plush, rounded couch, raise your glass to the ceiling of the internal temple (really) and give thanks to the God of bubbles. Created in collaboration with Perrier-Jouet champagne, this is how champagne was meant to be enjoyed. Go for: The mix of music, glamour and the chance to seclude yourself away with friends in your own champagne temple. A worthwhile stop for an out-of-Sydney adventure that won’t break your budget, or blowout the travel itinerary. Peterson Champagne House is nestled away in the Hunter Valley. Just head north out of the city and once you arrive you’ll have swapped the bustling high-rise town centre for rolling vineyards, clear open skies and long dirt roads. Peterson Champagne House is a dedicated sparkling wine house and has been producing its traditional, French-method Australian sparkling since 1995. Matching the house-made sparkling is their dedicated oyster bar, so take the time to relax on the wooden deck over a dozen Port Stephens oysters, a glass of the local sparkling and take in the full panorama of the Hunter Valley region. The Lyall is one of Melbourne’s boutique five-star hotel offerings situated in South Yarra. Everything you could possibly need is in-house, turning this small hotel offering into its very own destination hotspot. Included in this ‘everything’ is the Lyall champagne bar, a cosy lounge that transforms into a welcome retreat for the avid shopper after a day out. Take a seat at the bar and enjoy a glass of champagne from the menu, or settle in with a friend at a table for two and rehash the day’s events over a bottle. Go for: The chance to enjoy some classic Melbourne hospitality without the hassle of a bigger volume hotel. And your own, dedicated champagne bar. The Morrison Bar and Oyster Room is a newish addition to the Sydney scene, showcasing the new level of dining you can expect around town. White kitchen tiles offset dark and heavy interior wood panelling, while a dedicated oyster program and a smart list of sparkling wines will keep you in cheerful company. The kitchen offering is under the guidance of internationally-recognised chef Sean Connolly (formerly Astral and Sean’s Kitchen), and has a strong focus on ‘in the shell’ and ‘on the bone’ cooking to match your choice of bubbles and oysters. Go for: The chance to sit at the prominent centre bar and order from a range of nearly 30 types of oysters, shucked to order and matched to a glass of bubbles. Put on your best and get ready to get heady. Extravagant lounge Hemmesphere is an original icon of Sydney’s champagne lifestyle, and no wonder: tucked away in one of Sydney’s most exclusive nightlife playgrounds – the Establishment Hotel – it’s managed to stay at the forefront of the high-end nightlife scene by never letting up on its dedication to finesse. 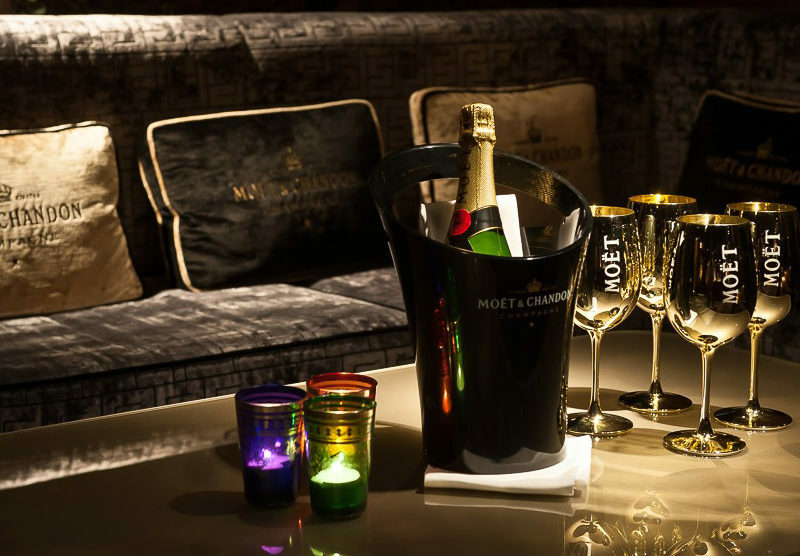 Grab yourself a tight-knit group of champagne enthusiasts, sink into the plush lounges that adorn the level four venue and share a few ice-cold bottles of French elegance brought to your table by swishing, black-clad hostesses. Go for: A champagne experience that just can’t be reproduced anywhere else. Hemmesphere’s high-class matches the refined nature of champagne to a tee. The Cuvée Lounge Bar at Sofitel Brisbane offers a luxurious experience right in the heart of Brisbane’s CBD. The drinks menu has a wide range of vintage and non-vintage labels from the world’s best champagne houses for you to choose from. You can also pair your bubbles with BBQ Squid A La Pancha, Tasmanian smoked salmon served with caviar, condiments and toast, or a half dozen oysters with lemon and shallot vinegar. Go for: To bask in the views of the Brisbane skyline at night while pairing the experience with a bottle from the world’s best champagne houses. Mistelle is a wine bar located in the lively Kiaora Lane in Double Bay. Enter through the courtyard, select a glass – or bottle – from the eight different types of champagne on the menu and pair it with a number of the modern French dishes that are designed to share. Sit back and drink in the atmosphere. Go for: A cosy, intimate glass of champagne at the end of a long day or a great date spot to make you feel like you’ve stepped into a hidden side street in Paris.